There’s no doubt that social media has exploded in recent years with more people than ever going on-line. However many businesses take a cautious approach to using sites like Twitter or Facebook to promote themselves, when really they should jump in with both feet. If you run a hotel then there are a vast number of ways you can promote yourself, especially if you already have the media to hand. The problem isn’t one of not having content – many hotels have plenty – it’s using it and using it well. What’s more, it seems that some of your best media can get a huge amount of reach. 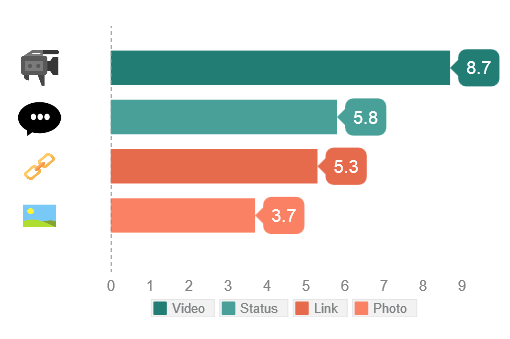 For example, we suggest videos are a fantastic way to engage with your clients, but a survey by Social Bakers has recently shown that native video has the best organic reach of any kind of media. If you’ve ever uploaded a video anywhere then it’s likely you’ve done it to YouTube – it’s the most popular of all video sites. Likewise, if you’ve shared a video on Facebook then you probably used a link to it on YouTube. They play just as well within the time line, so why not? Well, Facebook would prefer you to upload it directly to Facebook and they’ll reward you with better reach meaning more people will see it. Do you already have videos? Then why not upload them to Facebook then? However don’t just ‘fire and forget’, add a little bit of a story to your post and explain what the video is about and importantly – ask people to comment on it. In our own testing, we discovered that engagement works best when you ask the question first. So, ask your audience what they think of the video, ask them if they have videos they could share and actively encourage them to talk to you. Ideally your Facebook page should be reaching more potential customers. You want it to reach people who might one day come and stay at your hotel. However, they will only see your page if you engage with others regularly and show that you keep your information up to date. If you’re the sort of company that just posts links to blogs every day or maybe adds the odd status update, Facebook won’t put your posts in front of the people that matter. It’s algorithm is a complex beast, but in essence, the more you do, the more people you’ll reach. So, use your page to chat with people, to promote your events and to crow about the things you’re doing and have done. Encourage people to get in touch and interact with you and, as the graph above suggests, post a lot of engaging content – preferably video!